I know we all try to think of things we are thankful for at this time of year so I will put in my 2 cents. I am thankful for my wonderful family and for the fact that they all now live close by. I am thankful for my fantastic husband who support me in (almost) whatever I do. I am thankful that I still have my mother and that we enjoy each other's company. I am thankful for my friends - new and old. I am thankful I can live in my home state of Maine and enjoy her seasons. I am thankful I am healthy enough to quilt a little every day. 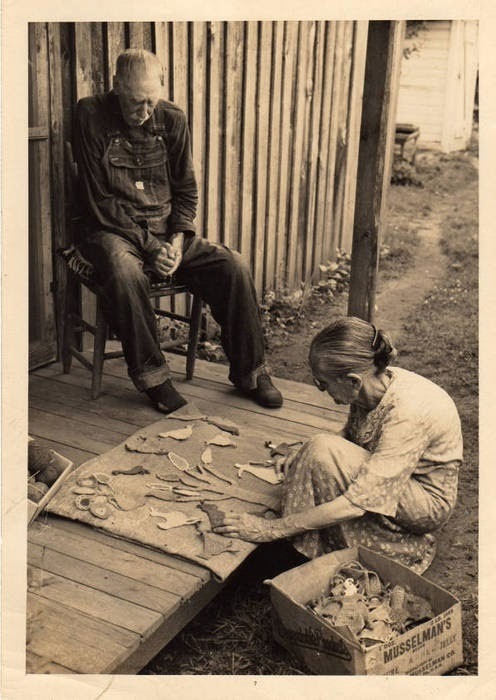 And yes, even after yesterday's rant about today's technology, I am happy to have the Internet to keep in touch with old friends and find new ones and to be able to find fabulous photos like this one of my husband and I (hopefully) in 30 years! I'm only posting photos of my DJ progress so you won't be bored by my "conclusion" rant. I think I have always known it, but it seems more evident each year that I was born in the wrong century. I just can't wrap my head around all this technology. After enjoying so many wonderful Blogs over the past 4 years, I finally decided to take the plunge and start my own. After deciding it wasn't so hard I thought I would join the millions of "smart" people and sign up for Facebook. ARGH! What was I thinking? At first it seemed fun, I found friends I hadn't seen since I was on the board of AQSG. Then I started getting friend requests. Thousands of them. This in itself wasn't the worst part - I couldn't figure out how to get back to my site!! Am I the only one left in the free world who doesn't own a "smart" phone and can't seem to get a grip on the overwhelming speed of technology? So, if you are one of those wonderful people I have finally found after all these years, please be patient while I try to understand the ways of social media. Thanks for listening. Here are a few shots of recent "Cooking with Jane" blocks. Sorry for the poor quality. There isn't much light around here at 4:30 in the morning. I try to work a little every morning before I leave for work at 6:30. I think I will take a walk at lunch time and remind myself how lucky I am to escape the spinning pace! Enjoy your day. I truly believe that quilters are the best people on earth. I felt since I had now joined the thousands of others who have undertaken the joyful task of reproducing this quilt, that I should reach out to some of you. I started by going to the DJ Website and tried to order the pin so I could be instantly noticed by other Janiacs when attending shows, etc. Well, long story short... I tried without success to order it online so I e-mailed the website and got a wonderful note this morning from non other than Brenda Papadakis herself! How sweet is that? I can't believe I waited so long to "join up" and I look forward to meeting Brenda and her many, many followers soon. Here are the two I am finishing up today. I try to name all my "potholder" quilts with a cooking theme (ie. No Bake Applique, A Baker's Nine, Pan Blackened Applique, etc.). This seems ironic since I hate to cook. So, I am calling this one "Cooking with Jane". I took a few photos of the blocks I have done so far. They look so neat and tidy in the box don't they! I have hand quilted as many as I can, but some of the ones with tiny pieces I have machine quilted in the ditch before hand quilting the larger, more open parts. This little star is machine quilted in the tiny center and then hand quilted around it. 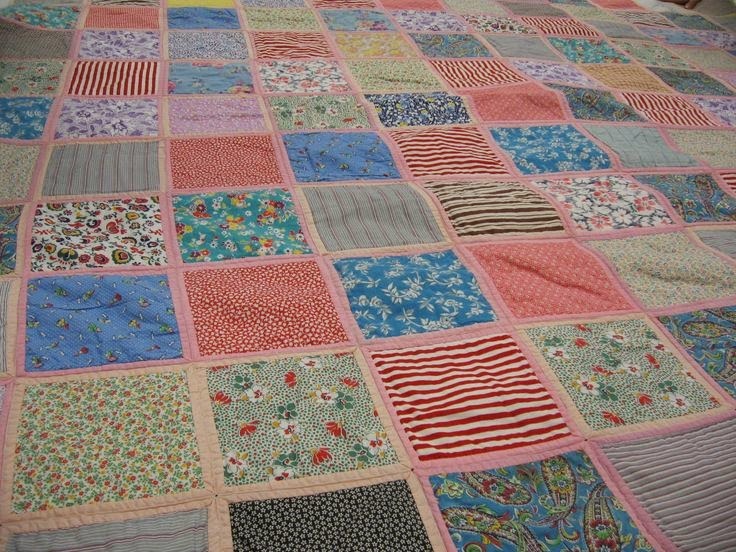 Jane's original quilt has varied widths of sashing, but it seems that most "Baby Janes" have used a 1/2" to 3/8" sashing. My blocks finish 5" with the 1/4" binding so when they are all whip stitched together it will appear that they have a 1/2" sashing in each row. I think my favorite part of making these potholder quilts is playing with all the finished blocks. I will pieced these together in the same order as Jane did, but it is fun to play with different layouts! Sorry this next one is a bit blurry. Here are a few of the back of the blocks, you can see the binding better. And here are a few that need still need to be stitched. Since there are a lot of bindings in a potholder quilt, it is imperative that your binding corners come to a nice sharp point, otherwise when you join them together you will have a gap at the intersections. Of course one way to deal with bad corners is to stick a yo-yo or button at each intersection, and yes, I have done that before! It's like eating peanuts, one just leads to another! Hope I have inspired you to give it a try! I first saw Jane Stickle’s incredible quilt in 1988 while visiting Vermont. I was amazed (as is most everyone who has ever seen it) at its beauty and charm. 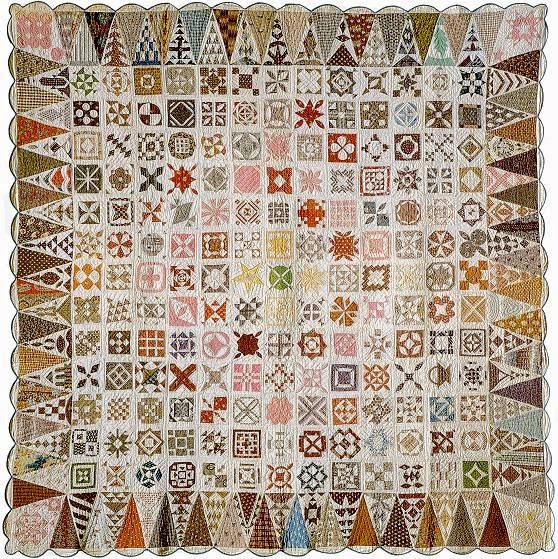 Although I knew nothing about Jane Stickle at the time, I felt an instant connection with her as I studied the patterns and layout of this special quilt. So, as with most of my quiltmaking promises, I put off starting the monumental task of trying to draft this beauty. Then when Brenda Papadakis’ wonderful book “Dear Jane”, came out, I thought, wow, here’s my chance. But of course once again, I hesitated and the world exploded with Baby Jane’s everywhere. Not being one to jump on any bandwagon, I once again let my thoughts of making this quilt drift away. Then, while visiting the infamous Pam Weeks (AKA potholder Pam) and Laura Lane (Collections Manager at the New England Quilt Museum in Lowell, MA) at Maine Quilts 2014 in July, she challenged us to make a Baby Jane in the potholder method. Both Pam and Laura were working on potholder blocks at the time and something came over me and I said yes! I decided to make the blocks in the order in Brenda’s book for fear if I varied from the order, I would never finish them. I started on August 1st and I hope to have most of the 5” blocks (mine will measure 5” finished with binding) done by the end of the year and then I will work on the cone border pieces over the winter. I think the cone shape will be a bit of a challenge when whipping them together, but I’ll keep you posted. Here are the two I am currently working on. I am trying to match the fabrics Jane used as close as I can. Each block has the same backing fabric as the front, so the back of this quilt will be interesting as well (as most potholder quilts are!). As you can see by the photo, when I am hand quilting the blocks I baste the blocks to muslin to fit into my 14” hoop so that I don’t waste any of the backing fabric. And I re-use the muslin over and over. I love the format of Brenda’s book and her sweet letters to Jane. I feel another strong connection to Brenda because of her wonderful letters to this special woman. Brenda did a fantastic job of drafting these blocks (from a photograph, I might add) but I have re-drafted many of the blocks to suit my way of quiltmaking. Mostly because I am lazy and would rather applique any day over piecing so, I have adapted many of the “pieced” blocks to accommodate my preference to applique. I will try to update my progress here as often as I can. I don’t like to take too much time away from quilting! 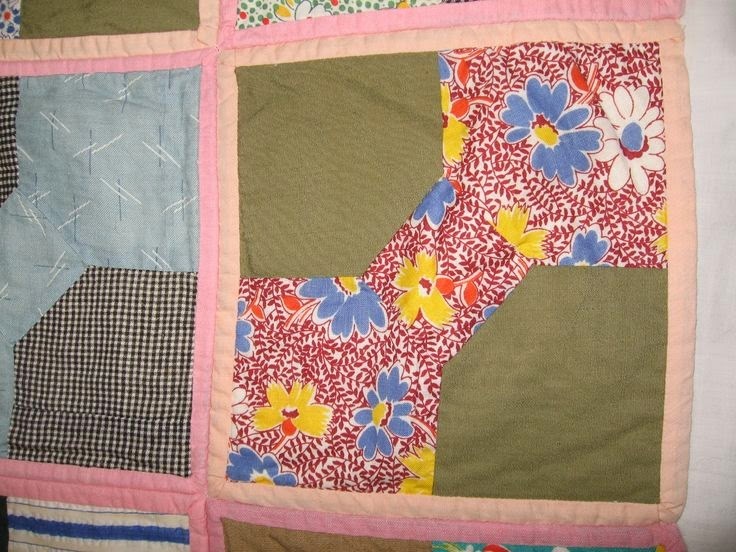 Hmm.. Potholder post sounds like something you should be eating for breakfast, but at any rate here are a few photos of Ann Morin's c1940 potholder quilt as promised. 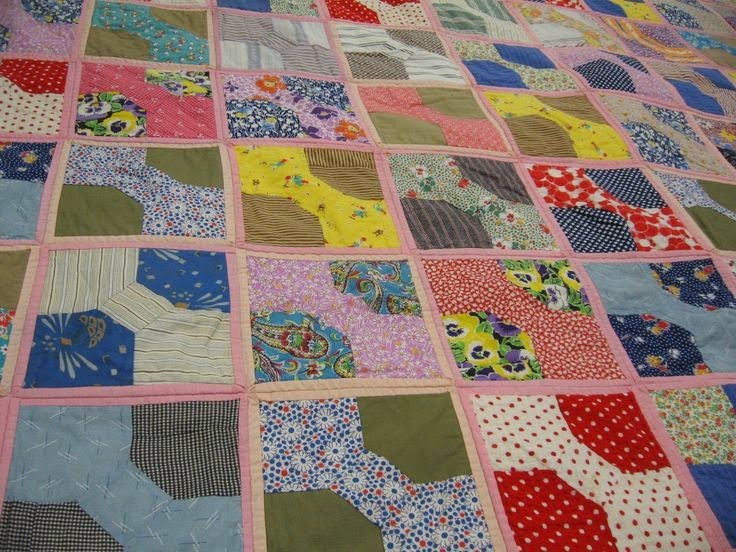 I love seeing early 20th century potholder quilts. It gives me hope that we will be able to carry on this traditional and (did I mention) "fun" method of quiltmaking!